Every morning, as part of our daily classroom routine, my entire fifth grade class would stand up, face the flag, and recite the above passage from the Declaration of Independence. Unfortunately, by the end of September, the words were barely recognizable and the monotone chorus was enough to put a roomful of roosters to sleep. Today, as I look back on this moment, I cringe at the missed opportunity to empower my students with the tools to make these words a reality, not just a formality. Thankfully, I spend a lot of time today talking about the pursuit of happiness. In fact, I’ve written several blogs on this topic. Click here to read one. Often in our pursuit to achieve something, it’s important to understand where NOT to go or what NOT to do. Just as certain road signs inform us where NOT to go (i.e. no left turn) or what NOT to do (i.e. speed limits), so too do the road signs of life. 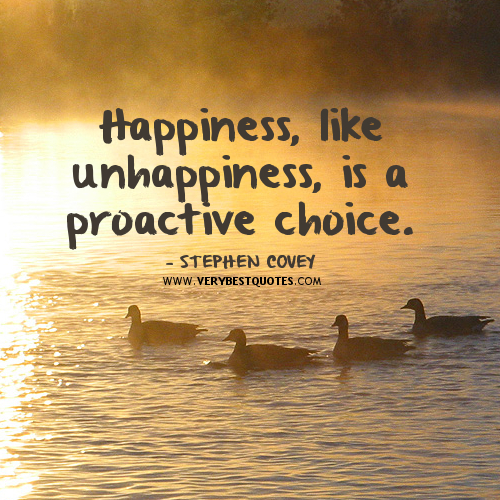 Having said this, I’d like to share my TOP 5 Surefire Ways to Pursue Unhappiness. Complain. Let’s face it. If you and I wanted to, we could take part in the world’s largest Complaint-Fest, complete with some of the all-time greatest whiners. It’s an easy thing to do. Unfortunately, any time you complain, you’re essentially giving your happiness away to someone or something else. Run away from your problems. When adversity shows up at your front door, the easiest thing to do is close the door and run the other way. While this might very well be a quick-fix, temporary solution, the fact remains – wherever you go, there you are. When you run away from adversity, you run away from happiness. Compare yourself with others. Comparing is always done in an up or down fashion. In other words, you’ll never measure up to certain people (compare up), but will always be better than others (compare down). Unfortunately, neither of these leads to happiness. Comparing up leads to feelings of inferiority, while comparing down leads to a false sense of pride. Happiness occurs when you measure yourself with who you were the previous day. Be better than that person. Worry about things that haven’t happened yet. If you allow it to, your mind will quickly transform worry into anxiety or despair. As is the case with complaining, each time you worry, you essentially give your happiness to the thing you’re worrying about. By the way, as you’ve probably heard, the majority of the things you worry about will never happen. Spend your time in gratitude and be thankful for all of the great things that have already happened. Try to change others. Whether your intentions are good or not, you’ll never be able to change another human being. When it comes to other people, change is often conditional. In other words, you want someone else to change so that your happiness levels will increase. Sadly, this often backfires as the recipient of the change becomes defensive and pushes away. The best way to change someone else is to change yourself first. If you want people around you to be happy, then you need to choose happiness for yourself. I invite you to complete a personal inventory with regard to the five unhappiness strategies above. If you recognize that one or more of them is something you do often, I encourage you to own it and move in the direction of authentic happiness. By the way, authentic happiness will only occur when you make a commitment to do the opposite of what’s listed above.